One of the legends of a golden era of amateur rugby, Colin Meads was the epitome of the All Blacks hard man. He came from a traditional farming background the typical profession of All Blacks and he remains working the land to this day on the outskirts of Te Kuiti, on North Island. He was known universally as Pinetree - a nickname given to him by his New Zealand Under-23 team-mate Ken Briscoe on the 1958 tour of Japan. It was an appropriate moniker because while physically he was no bigger than many of his contemporaries at 1.92m and weighing about 100kg, Meads had a massive presence within teams he represented. A colourful character that encompassed a golden era of rugby in New Zealand, Meads became a folk hero who is still held up as a nostalgic symbol of All Blacks dominance. 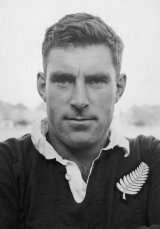 In 1955 Meads made his debut for King Country, his provincial team that he played for 139 matches. His first match for side was against Counties and was memorable not only because he scored a try but extraordinarily kicked a dropped goal. The same year Meads toured Sri Lanka with the New Zealand Under-21 side. On tour he demonstrated that he was one of the season's most promising players, featuring in all eight matches and scoring three tries. Meads was playing in the national trials and for the North Island team during 1956 but did not don the famous black jersey until 1957 when he was selected for the tour of Australia. On that trip he played in 10 of the matches and was capped in both the internationals against the Wallabies, being used a flanker and No.8 and remarkably scored the first of his seven international tries from the wing. In the days of non replacements Meads had been placed there from the flanker for Frank McMullen, who was receiving medical attention. From 1957 onwards Meads became an almost permanent fixture in the All Blacks squad. He missed the first Test against the British and Irish Lions in 1959 but the following year he had an outstanding tour of South Africa. His try in the second Test clinched victory for the All Blacks and cemented his place for many years to come, although not always at lock. In 1964 he was used at No 8 for a Test against the Wallabies, but a 20-5 defeat convinced the selectors that the experiment should not be repeated. Meads played a major part in the tour to Britain and France in 1963 and also helped to clock up series victories in 1965 and 1966 over the Springboks and the Lions and again on another successful British tour in 1967. Throughout the decade Meads had formed a formidable forwards pack with Kel Tremain and Ken Gray. He played into the early 1970s when he was in his 30s. In 1971 he led an inexperienced All Blacks team to a series loss to the Lions - which remains New Zealand's only defeat by the British and Irish composite side - it would mark the end of his long and illustrious 18-year career. Meads finished with 361 first-class matches, 133, including 55 Tests, were for the All Blacks. From the playing fields to the boardroom, Meads entered administration and coaching. He became a successful chairman of the King Country union and the first XV enjoyed a lengthy spell in the first division of the NPC. He was also a coach and selector of North Island sides and was elected to the national selection panel in 1986. It was then that Meads fell foul with the NZRU hierarchy when he toured with the unauthorised Cavaliers to South Africa as the coach. He was cut from the panel but was forgiven in 1992 and elected to the NZRU council. Meads remained hands-on with the All Blacks and was the manager of the team when they travelled to the 1995 World Cup in South Africa. Meads has been received a number of honours for his contribution to the game. He has been inducted to the International Hall of Fame and the New Zealand Sporting Hall of Fame and in 1999 was voted the Player of the Century at a NZRU awards dinner. He was made a New Zealand Companion of Merit, the equivalent of a knighthood, in the 2001 New Years honours list. Despite his fame and iconic status in New Zealand, Meads remains a humble sheep farmer who is typified by a bygone era in New Zealand and rugby.